We've been talking about building a proper cutting table for over a year. Before Stitches, Adrienne popped into Urban Ore and saw this huge table. When we returned from Stitches, Aday and I stopped by Urban Ore. Sadly, the table had sold. Though, through a turn of luck, we ended up able to purchase it. 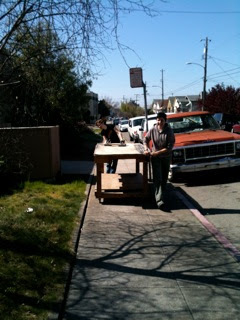 Aday and Sarah O. wheeled the table 7 blocks to the shop! We then found ourselves unable to fit it through the door. We took the casters off and the door off its hinges. 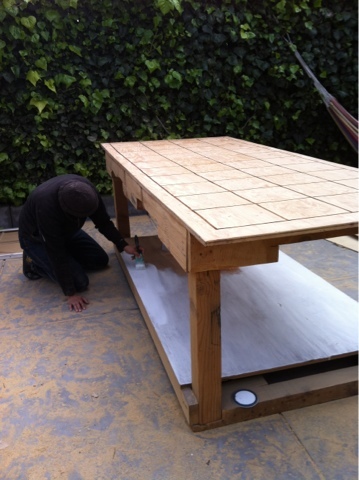 Aday sanded the table, routed 9 inch x 9 inch panels into the top of the table, and varnished it. Voila! We have a huge new table to cut fabric and patterns!